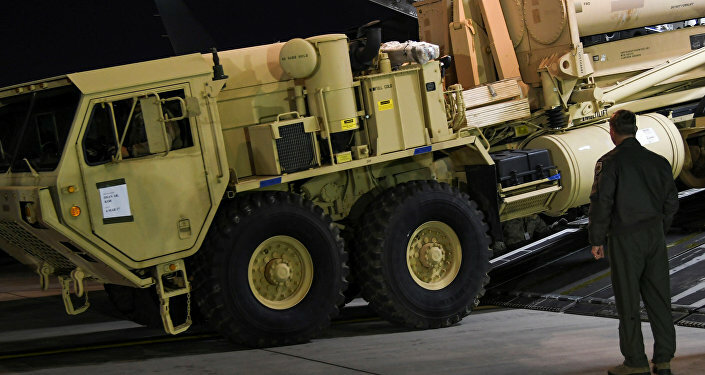 In South Korea, the US military started moving equipment for the THAAD missile defense system to its deployment site. The transport of radars and other military gear caused local residents to clash with police forces over the controversial installation. The positioning began early Wednesday morning at a golf course in South Korea, Yonhap reports. South Korea's Ministry of National Defense confirmed the beginning of full-scale deployment following reports of the installation, saying, "The measure this time is meant to secure early operational capability by positioning some available parts first at the site." According to the ministry, THAAD will be fully operational by the end of 2017. THAAD has been a point of contention not only among residents and law enforcement: Beijing has also been an outspoken critic of the THAAD system's placement in South Korea. THAAD is a ground-based missile interceptor system primarily designed to thwart medium range missile threats. Chinese government officials see THAAD as an encroachment of US military might in the nation's backyard. THAAD's radar elements essentailly provide the US military with eyes into some of China's missile testing. Beijing feels it could be used to surveil and disrupt their nuclear program and missile systems.